O'Toole joined Northampton from Bristol Rovers in 2014. 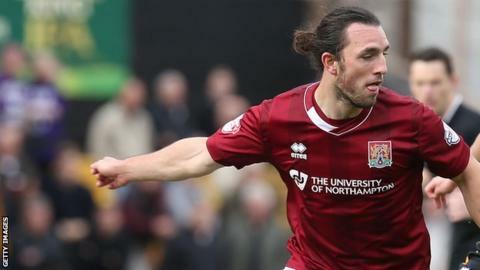 Northampton Town manager Chris Wilder has taken midfielder John-Joe O'Toole off the transfer list. The 27-year-old, who joined in June 2014, was told he could find a new club at the end of last season, just 10 months into a three-year contract. "He's playing in a manner of why we brought him to the football club," Wilder told BBC Radio Northampton. "It's taken a while for him to get going, but we're delighted with his performances." O'Toole has made eight League Two appearances so far this season, scoring twice, including the winning goal against former club Bristol Rovers on the opening day of the season. The Cobblers have earned 17 points from their last eight games and are up to fifth in the table after Tuesday's 3-2 win over Carlisle United. "John-Joe has been pivotal in this really good run we've been on," added Wilder. "He's been doing extra work in training and we are delighted with his efforts, so long may it continue."